AirAsia X announced on 14-Oct-2013 that TAAX had received approval from Thailand’s Ministry of Transport for an Air Operator Licence (AOL). This allows the carrier to move towards securing an Air Operators’ Certificate (AOC), which it expects to receive by the end of 2013 following proving flights planned for late 2013 using an A330-300 dry leased from its Malaysian sister carrier. AirAsia X has allocated a second aircraft to the new joint venture which will be delivered within a month of the AOC being issued. TAAX is now hiring pilots, flight attendants and engineers to support the initial fleet of two A330-300s, which will be configured with 365 economy and 12 flat bed premium seats – matching the configuration used by AirAsia X in Malaysia. AirAsia X CEO Azran Osman-Rani tells CAPA that TAAX plans to initially operate charter flights, which will commence shortly after the AOC is secured. This will give the carrier some lead time to announce and start selling scheduled services, which are expected to begin by the end of 1Q2014. Mr Azran says the two aircraft will be able to support an initial network of three destinations. For now TAAX has been only allocated two aircraft in its first 12 months of operations. But AirAsia X has the flexibility to potentially accelerate the expansion of the Bangkok-based fleet depending on market conditions. AirAsia X has stated that TAAX will focus on destinations in Australia and North Asia that are already served from AirAsia X’s Kuala Lumpur base. This reduces cost and exposure as TAAX will not have to invest in opening new stations. It also enables TAAX to leverage the brand AirAsia X has built up in existing markets. In Bangkok, TAAX will also be able to leverage the AirAsia brand as Don Muang is by far the largest base for AirAsia Group short-haul affiliate Thai AirAsia. Don Muang is also served by Malaysia-based AirAsia Berhad and another of the group’s short-haul affiliate, Indonesia AirAsia. Thai AirAsia currently serves 20 international destinations and 12 domestic destinations from Don Muang, according to Innovata data. Some of these destinations are also served from Kuala Lumpur. But where there is duplication with the Kuala Lumpur hub, AirAsia will be able to offer more options for connecting passengers and in many cases better connections. AirAsia X will also offer passengers the ability to fly via Kuala Lumpur in one direction and Bangkok in another direction. Eight of Thai AirAsia’s 12 domestic destinations are four of the carrier’s 20 current international destinations are not served by AirAsia from Kuala Lumpur. This will open up new connections from Australia and North Asia to destinations such as Mandalay in Myanmar. Thai AirAsia is rapidly growing its fleet and network following a May-2012 IPO, with eight additional 180-seat A320s slated to be delivered in both 2013 and 2014. The carrier’s expansion will open up even more connection opportunities with TAAX, particularly as several of its planned new destinations are not currently served by AirAsia from Kuala Lumpur. Thai AirAsia-TAAX is a win-win relationship with the long-haul carrier needing short-haul feed to fill its 377-seat aircraft while Thai AirAsia’s load factors will benefit from carrying connecting passengers that come off TAAX. Thailand’s LCC market is becoming increasingly competitive and the ability to not rely entirely on the point-to-point market and short-haul city pairs will give Thai AirAsia a competitive advantage over the other LCCs in the market. Nok Air is Thailand’s other main LCC but is a domestic carrier with the exception of only a few routes to Myanmar. It is affiliated with Thai Airways but does not feed its largest shareholder as Nok is based at Don Muang while Thai is based at Bangkok Suvarnabhumi. In recent years Nok and Thai Airways have looked off and on at establishing a long-haul low-cost carrier, either as a new operation under Nok or as a totally new entity following the model Singapore Airlines has used with Scoot. So far neither Nok nor Thai Airways have made a move and this delay could prove to be costly. The upcoming launch of TAAX has prompted Nok and Thai to re-look at its long-haul low-cost options. TAAX will be targeting some of Thai Airways’ most lucrative markets which have become more critical to the carrier as LCC competition has intensified in Thailand’s domestic and short-haul international market. Meanwhile competition in Thailand’s short-haul market is about to further intensify due to the launch of Thai Lion and Thai VietJet. Thai Lion, which will be 49% owned by the Indonesia-based Lion Air Group, is aiming to launch services by the end of 2013 and also recently secured an AOL from Thailand authorities. Thai VietJet, which is 49% owned by small but fast-growing Vietnamese LCC VietJet, is hoping to launch services in early 2014. AirAsia is well positioned to fend off the new competition as, along with Nok, it has first mover advantage in Thailand. Both have strong brands in Thailand while Lion and VietJet will have significant work to build up their brands, which are not well recognised outside their home markets of Indonesia and Vietnam. Thai AirAsia also is the largest LCC in Thailand, giving it scale, and will receive a new source of traffic as its new sister company starts to penetrate medium/long-haul routes, which represent a new growth area for LCCs than an area of increasing competition. The CEO and largest shareholder of Thai AirAsia parent Asia Aviation, Tassapon Bijleveld, also is the largest shareholder of TAAX with a 41% stake. A 49% stake is owned by AirAsia X Berhad, which has been listed in Malaysia since Jun-2013. The remaining 10% is held by a second local investor, Julpas Kruesopon. AirAsia X Berhad will have similarly sized stakes in its affiliates, starting with Thailand. It is a separately listed company from the original AirAsia Berhad, which completed its IPO in 2004, although there are some common shareholders and a long-term licensing agreement in in place that allows AirAsia X to use the AirAsia brand. AirAsia X also has the right to be the operator of all AirAsia-branded services over four hours from all Southeast Asian markets. In countries where AirAsia already has a short-haul affiliate its local partner has the right of first refusal for potential AirAsia X franchises. Mr Tassapon’s decision to invest in TAAX makes things significantly easier as having separate local owners at Thai AirAsia and TAAX could have led to future sticking points. 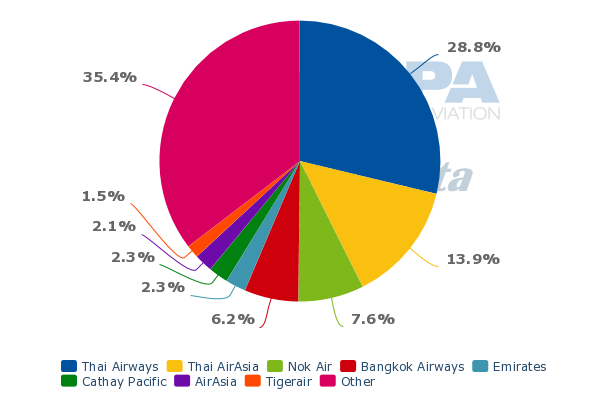 Thai AirAsia currently accounts for about 46% of LCC seat capacity in Thailand and about 14% of total capacity, according to CAPA and Innovata data. It is the second largest carrier in Thailand after Thai Airways, which has about a 29% share of total capacity (includes regional unit Thai Smile). When including other AirAsia carriers, the AirAsia brand currently accounts for about 54% of LCC seat capacity in the country and about 17% of total capacity. This includes about 29% share of total capacity in Thailand’s domestic market and about a 12% share in Thailand’s international market. There are currently 22 LCCs serving Thailand. Three of the five largest LCCs in Thailand's international market are AirAsia carriers. The launch of TAAX and further expansion from Thai AirAsia will lead to a significantly bigger share for AirAsia in the international market. In comparison, the AirAsia brand now accounts for almost 40% of total international capacity in Malaysia. Such a high figure in Thailand will be nearly impossible to achieve given the more intense competition in Thailand. But there is room for significant international LCC growth in Thailand, with AirAsia best positioned to drive that growth once it has both short and medium/long-haul operations up and running. Thailand’s international LCC penetration rate is now only about 20% while Malaysia has an international LCC penetration rate of about 48% and Singapore about 31%. As Thailand has the largest leisure market in Southeast Asia, the 20% penetration figure is very low. Thailand’s lack of a long-haul LCC partly explains the lower rate compared to Singapore and Malaysia, which has Scoot and AirAsia X respectively. But there is also room for significant LCC growth in Thailand's short-haul international market, which will occur as Thai Lion and Thai VietJet launch and as Thai AirAsia pursues further rapid expansion. Nok is also starting to pursue international expansion. At Don Muang the AirAsia brand currently accounts for 96% of total international capacity as Nok is predominately a domestic carrier. Nok and AirAsia have similarly sized domestic operations. The AirAsia Group currently accounts for about 65% of total capacity at Don Muang, which is Bangkok’s older airport. In late 2012 AirAsia moved its Bangkok operation from Suvarnabhumi to Don Muang, which is less congested and cheaper to operate from. Thai Lion also plans to be based at Don Muang. While TAAX will rely significantly on transit traffic, it will also be able to tap into a large local market, which is driven mainly by inbound demand. Thailand has huge potential as a medium/long-haul LCC market as it is primarily a price-conscious leisure market. The market can be stimulated with low fares, which has been proven by the short-haul LCCs serving Thailand as well as the Gulf carriers. While Emirates, Etihad and Qatar Airways are full-service carriers they have pursued aggressive expansion in Thailand on the back of relatively low fares in the Europe-Thailand market, where they offer convenient one-stop connections from a wide array of European cities. Norwegian Air Shuttle also is now stimulating the Europe-Thailand market with its new service to Bangkok from Oslo and Stockholm. Norwegian launched services to Bangkok in May-2013 with A340s and is now serving both routes with three weekly 787 flights. Australia is a logical market for TAAX as it is the largest single market for AirAsia X, accounting for nearly 40% of its total seat capacity as of Dec-2013. AirAsia X currently serves four Australian destinations – Gold Coast, Perth, Melbourne, Sydney – and will add its fifth Australian destination, Adelaide, on 30-Oct-2013. AirAsia X will become the third largest foreign carrier in Australia after Emirates and Air New Zealand in Dec-2013, after it launches Adelaide and increases capacity to Perth, Melbourne and Sydney to double daily. AirAsia X already sees a large volume of connecting passengers that fly between its Australian destinations and Bangkok. These passengers now connect in Kuala Lumpur between AirAsia X and AirAsia, which has a high frequency service from Kuala Lumpur to Bangkok Don Muang. Kuala Lumpur is currently AirAsia's largest route from Don Muang with over 10 daily flights. Scoot also sees a large volume of connecting passengers between Australia and Bangkok. Scoot now serves Gold Coast and Sydney and will launch services to Perth as its third Australian destination on 12-Dec-2013. Scoot serves Bangkok Suvarnabhumi with one daily flight, its shortest route which it launched in 2012 partly to accommodate Thailand-Australia connections. It also offers connections with Tigerair Singapore, which has several daily flights to Bangkok, ensuring faster connections on a round-trip basis for Scoot’s Australia-Thailand passengers. Australian long-haul LCC Jetstar only offers non-stop flights to Bangkok from one Australian city, Melbourne. This service currently only operates three times per week. Jetstar also offers connections to Bangkok from Perth and Darwin via Singapore and from Sydney via Melbourne. It also offers a one-stop product in the Bangkok-Melbourne market via Singapore to complement its non-stop frequencies. Jetstar also currently operates three weekly flights from Sydney to Phuket, Thailand’s second largest destination. Jetstar in Sep-2013 announced it will also launch services from Melbourne to Phuket from 14-Dec-2013, citing the large volume of traffic it has seen between the two airports via Singapore and Melbourne. Phuket is a potential second base for TAAX but for now AirAsia will serve the Phuket market only from Kuala Lumpur and Bangkok, where carriers can connect onto the AirAsia X network. TAAX could opt to compete against Jetstar on Bangkok-Melbourne or chose Bangkok-Sydney as that route is currently not served non-stop by any LCC. 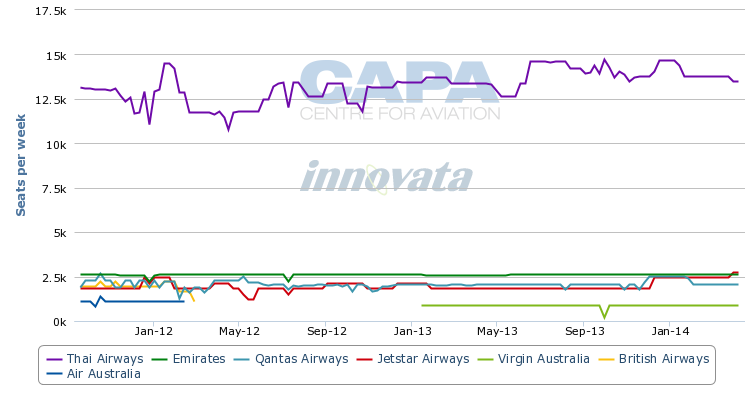 Jetstar could potentially respond in the medium to long term by taking over the Sydney-Bangkok route from full-service parent Qantas. It could also increase capacity on Melbourne-Bangkok if Thai AirAsia X enters. But in the short term Jetstar does not have the widebody aircraft to expand as it instead is now focusing on rapidly replacing its A330s with 787-8s. The four Australian airports that are now served by AirAsia X from Kuala Lumpur are all courting the new carrier, eager to stimulate growth to Thailand as the carrier has done in the Australia-Malaysia market. There are currently no non-stop LCC service to Bangkok from Perth or Sydney, which the airports see as a void following the huge success of LCC services to other Southeast Asian destinations, including Bali, Kuala Lumpur and Singapore. Thai Airways currently serves four Australian points – Brisbane, Melbourne, Perth and Sydney – but provides less capacity into Australia than AirAsia X. Qantas and its joint venture partner Emirates also each operate one daily flight from Bangkok to Sydney. Emirates is often seen as a low fare competitor but AirAsia X has had no problems stimulating demand on routes also served by Emirates such as Kuala Lumpur-Melbourne. The Thailand-North Asia market is significantly larger but also more competitive. This market already includes LCC services from Thai AirAsia to southern, central and western China along with Hong Kong and Macau – markets TAAX will not enter as they are within four hour range of Bangkok. Bangkok-Beijing is a particularly good candidate for TAAX as it is not served by any LCCs. Thai Airways, Air China, Hainan Airlines and SriLankan are currently the only carriers on the route. Bangkok-Shanghai is more competitive as it is already served by Chinese LCC Spring Airlines along with Thai Airways, SriLankan, China Eastern, Shanghai Airlines and Juneyao. The route is about four and a half hours, enabling narrowobdy flights from all the Chinese carriers. The Thailand-China market is also served by several charter carriers that price competitively, working closely with Chinese travel agents offering package tours. AirAsia X does work with travel agents but third-parties only account for 8% of its total sales. Chinese carriers have an advantage in the Thailand-China market as the market is more heavily focused on inbound traffic compared to Thailand-Malaysia and the close ties Chinese carriers enjoy with Chinese agents. The same can be said for Thailand-Korea, another market dominated by inbound group tour bookings. AirAsia X now serves Busan and Seoul in South Korea, which makes both potential destinations from Bangkok. But the Bangkok-Busan market is relatively small and already competitive with Thai Airways, Korean Air and Korea-based LCC Jeju Air already on the route. Bangkok-Seoul is a huge market but is also intensely competitive with service from Thai Airways, Thailand-base Business Air, Korean Air, Asiana and four Korean LCCs – Eastar Jet, Jeju Air, Jin Air and t’way. The Korean LCCs only operate narrowbody aircraft. At nearly six hours, Bangkok-Seoul is barely within narrowbody range. It is a more economical route for widebody LCCs but the Korean LCCs on the route are backed strongly by Korean agents. AirAsia X also serves two destinations in Japan, Tokyo Haneda and Osaka Kansai. Thailand-Japan is a more logical initial market for TAAX than Thailand-Korea as its is less competitive and is not yet served by any LCCs. There is a large demand for services to Thailand from Japanese tourists and the market generally has higher fares than Thailand-China and Thailand-Korea. Thai Airways currently serves six Japanese airports – Fukuoka, Nagoya, Osaka, Tokyo Haneda, Tokyo Narita and Sapporo. Japan Airlines and ANA also serve Bangkok from both Tokyo airports and JAL also has an Osaka Kansai-Bangkok service. Delta and United also serve the Narita-Bangkok route with local pick-up rights. TAAX would easily be able to stimulate demand by offering its low fares in the Bangkok-Tokyo and/or Bangkok-Osaka markets. Other Japanese destinations are also possible for TAAX as AirAsia X plans to expand its Japanese network in 2014, providing for opportunities to serve secondary cities from both Kuala Lumpur and Bangkok. After focusing primarily on Australia growth in 4Q2013, Japan and other North Asia markets will be the focus in 2014 for Malaysia-based AirAsia X. The carrier will again have the capacity to expand as it takes more A330s. AirAsia X now operates 16 A330s, one of which will soon be dry leased to Thai AirAsia X. It will take delivery of two more A330s by the end of 2013 and seven additional aircraft in 2014. So far TAAX has only been allocated two aircraft by AirAsia X. That would leave the Malaysian operation with up to 23 aircraft at the end of 2014, up from 16 currently. But AirAsia X Berhad is also looking at establishing an Indonesian affiliate by the end of 2014 which would result in slightly fewer aircraft for the Malaysian operation. The company has stated the establishment of Thai AirAsia X is only the beginning of its “strategic multi-hub plan”. It believes having multiple hubs and multiple long-haul networks will give it “a strategic advantage over other competitors”. Indonesia AirAsia, which is already the largest international carrier in Indonesia, would benefit from partnering with a local AirAsia X affiliate just as Thai AirAsia will benefit from having TAAX. Indonesia’s largest domestic carrier, Lion Air, has said it is not interested in the long-haul low-cost model. This leaves a potential opening for AirAsia X in Indonesia, which is by far the largest country in Southeast Asia and has a rapidly growing aviation market that remains relatively under-served by medium/long-haul carriers. Bali is the expected base for Indonesia AirAsia X. AirAsia already has a base in Bali and accounts for about 14% of total capacity at the island’s airport. Bali has a large inbound tourist market, allowing a potential Indonesia AirAsia X to leverage the AirAsia brand in markets such as Bali-Australia and Bali-North Asia. Bali also does not have the infrastructure constraints of Jakarta, where basing a new carrier would be nearly impossible due to the lack of available slots. Manila, where new short-haul affiliate AirAsia Zest is based, also has a congestion issue that would make basing a new carrier at the city's main airport nearly impossible. AirAsia Zest recently raised the possibility of AirAsia X establishing a base at Manila alternative airport Clark. Philippines AirAsia, which has a partnership and equity stake in Zest, is in the process of moving its base from Clark to Manila International as part of a new AirAsia Group strategy for improving profitability of its struggling Philippine operation. But AirAsia X is not interested in Clark as a future base because Clark will no longer have any short-haul connections. AirAsia X has discovered connections are absolutely essential for the long-haul low-cost model. AirAsia’s position in the Philippine market is also much smaller compared to Indonesia or Thailand, making a long-haul affiliate more challenging at this stage. The largest LCC in the Philippines, Cebu Pacific, also recently launched a long-haul operation. With larger markets such as Thailand and Indonesia not currently having any local long-haul LCCs, the Philippines would not be a smart bet for AirAsia X. The upcoming launch of TAAX represents an important strategic step for AirAsia X and the long-haul low-cost sector. The new multi-affiliate model will usher in a new phase of rapid growth, as well as provide the synergies and economy of scale which are necessary to improve profitability. So far long-haul low-cost operations have been at best moderately profitable, and in some cases remain loss making. But the larger networks and scale that come with having multiple affiliates, along with the improved efficiencies which will come from the introduction of new-generation aircraft, will lead to a brighter outlook.